Our book club sometimes confuses itself with a food club. Oh, we read. And we take the books and our discussion seriously. But over time, we have moved from a simple rule of having the hostess provide snacks and wine for the evening to full-on dinner. And sometimes then some. The November club fell into the then-some category. Erica wowed the crew with an over-the-top baked pumpkin stuffed with all things delicious–Emmenthal cheese, fried bacon, bread chunks, loads of garlic, cream and scallions. 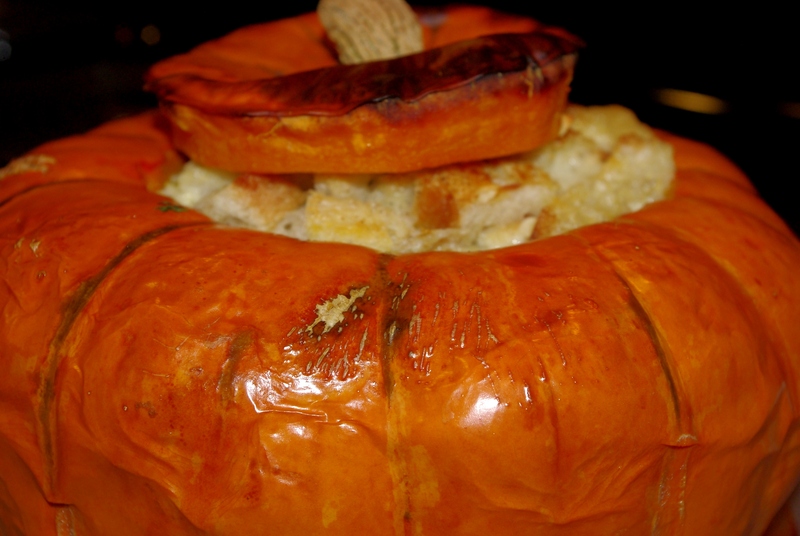 A hybrid of fondue and bread pudding, cooked in a whole pumpkin, the end result is a spectacular sight when pulled from the oven. And… it tastes as good as it looks. To serve, the cheesy concoction is dipped from its vessel along with a healthy scraping of delicious roast pumpkin — a nice balance to the richness of the filling. Served with a green salad, it made for a delightful and filling winter dinner. Not to mention a major distraction to the real reason we had gathered.